Over the last couple of years that I have been evangelizing for Telerik, I have met a lot of customers and in particular enterprise customers. Most of the big enterprises have SAP deployed in their organization. This gives them the flexibility of having point to point information with respect to their projects or revenue or even an employee. In short SAP is one of the widely used system in enterprises. But it comes with its own environment and applications. The number one question from enterprise customers for us has always been “how does your offering work with SAP?” A fair question especially when it comes to engaging with a third party vendor. This question was more of a high priority question when it came to Mobile teams in the enterprises. How soon can you go to market with an application and expose the SAP data. If you are as excited as I am, then be with me in this journey of 2 blog posts. So let’s get started. SAP ERP is an Enterprise Resource Planning software which provides an integrated solution that incorporates key business functions of an organization. I will not be delving too much in to SAP as a software as that is not the intention of the blog post. Now that we know what is SAP let’s see how to expose data from SAP so that applications outside of SAP can consume them. Technology that provides a simple way to connect devices, environments and platforms to SAP software based on market standards. 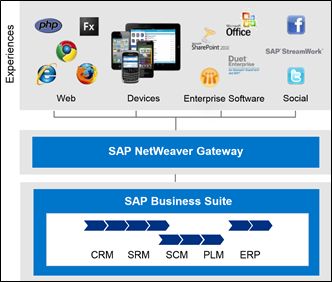 SAP Netweaver Gateway offers connectivity to SAP applications using any programming language and you do not need to have SAP knowledge. SAP Netweaver Gateway leverages the REST Services and OData/ATOM protocols for data exchange. Again I won’t be getting into too much details as to how you do this. SAP Community Network (SCN) has tutorials on how to do this. Services exposed by SAP Netweaver Gateway Demo system are all protected and need credentials to access them. In the previous section we talked about getting access to the demo system. During that process you would have used a username and password. You need the same credentials to authenticate against the demo system when querying for data. We can use IIS URL rewrite to create the reverse proxy. Here is an article on IIS rewrite: http://www.iis.net/learn/extensions/url-rewrite-module/reverse-proxy-with-url-rewrite-v2-and-application-request-routing. We can also create a simple reverse proxy using ASP.NET Web API. Notice that we pass an Authorization header when making a request. SAP Services expect an authorization header and we pass the username:password string converted to base 64 and pass it as a request header. I have showed the example of a Read or Get. But on the similar grounds you can create the Create/Update/Delete actions also. With this blog post we start a journey to read data from SAP and use that data in a mobile application. As a first step we learnt that SAP data can be exposed to outside world using the SAP Netweaver Gateway system. We looked at various the demo services and picked the Sales Order system as a candidate to build the mobile app. In next post we will create a mobile application using Kendo UI Mobile framework and Telerik App Builder.